The devastation left behind Hurricane Katrina is awful. 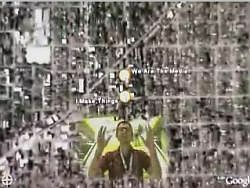 'johnmora' of Nashville, TN watched a helicopter video from the website of WLBT of Jackson, MS and created placemarks for showing the Google Earth locations for various shots of complete destruction shown in the video (based on timestamp). Here is his post at the Google Earth BBS. You should go to the WLBT website and select the video titled: "Mississippi Gulf Coast Damage from Skycopter 3". If you are viewing the video with Windows Media Player look to the lower right for the current time stamp, or when using the slider to go to a particular part of the video. You can load John's placemarks here . Then match the time stamp to the placemarks John created. If you haven't seen much of the video of the damage, this is one video you should watch. These placemarks help you see what it was like before these beautiful places were demolished. Para aquellos de Ustedes que se preguntan qué pasa con Google Earth en esos momentos en que no se tiene conexión a Internet, les digo que, asombrosamente, igual funciona. Pero unicamente mostrará lo que se ha almacenado en la cache. Si por ejemplo piensas llevar tu portátil a un sitio sin conexión de banda ancha, puedes utilizar GE para ver un área limitada. O utilizarlo para hacer alguna demostración sin conexión a la red. Primero ve al menú Herramientas->Opciones y elije la pestaña"Cache". Puedes hacer que el tamaño de ésta llegue a 2000 MB ( 2 Gigabytes). Esto te permitirá trabajar con más datos. Luego vé hasta el área de tu interés y recórrela al máximo de acercamiento posible. Las últimas imágenes que veas serán las que queden almacenadas en la cache. También deberías activar las capas que quieres que queden grabadas en la cache (por ejemplo, 'Carreteras' o 'Restaurantes'). Asi mismo deberías dejar activadas todas las marcas de posición que quieres ver luego. No lleva mucho tiempo llenar la cache, especialmente si el área que estás observando tiene muchas imágenes de alta resolución. Pero leí algo sobre alguien utilizando esto en áreas remotas de Africa con un GPS y una laptop para encontrar sus caminos. Hay también un truco mediante el cual se puede guardar la cache con diferentes nombres de archivo y luego cambiar entre ellos para disponer de diferentes áreas. (lean acerca de ésto aquí). Podría ser útil si el viaje implica no disponer de conexión durante largo tiempo. 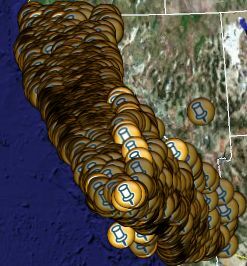 Not sure why someone would do this, but a guy called 'jpbrody' took the trouble of converting all 2500 registered trash locations in the state of California and converted them into a Google Earth KML (Keyhole Markup Language) file. You can view the trash here . He posted them at the GE Community BBS here. This means you can view all 2500 trash locations in California through Google Earth. Actually, it is kind of interesting to browse through and see which of the sites are actually visible from the satellite or aerial photos available. I'm sure 2500 sites is not unusual for a state the size of California especially since these are both current and past sites. Lots of people have been speculating on what Google's business model is by giving away a free version of Google Earth. Stefan Geens at OgleEarth.com has posted some interesting observations about this today at his site. One of his key points being the upselling strategy Google is already doing offering Plus and Pro versions. I agree that Google is probably already getting a significant revenue stream from this. I believe Google will make many of its advertising customers happy by providing access to location based information. For example, right now simple searches show me all the Best Buy locations or all the Holiday Inn Expresses. This works in Google Maps or Google Earth. And it is a fairly simple process to take these locations and download them into your GPS. I also believe Google has the opportunity to sell customized data to be delivered in their default layers and searches (just like with the main Google Search, more prominent placement in the search result is an advertising opportunity). But, what interests me as an entrepreneur is the enormous potential for business opportunities related to Google Earth. There are already some businesses forming around the Google Earth application. Some are focusing on providing online resources to find unique places in the Google Earth data - for example: gearthhacks.com has an extensive online gallery of GoogleEarthPlaces. They are getting thousands of visits per day to their site. So far, their primary source of revenue is advertising space on their pages. Others are offering services to sell to businesses to provide Google Earth reference data to help customers find their products and services. 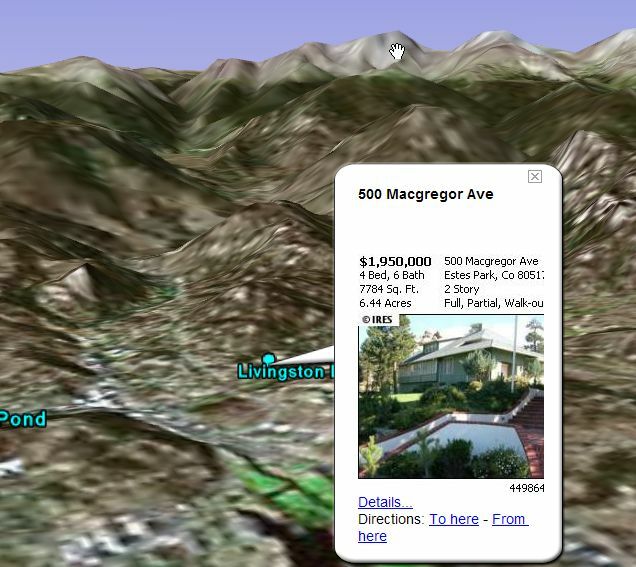 A real estate broker is offering information on homes through a large database through the Google Earth interface. 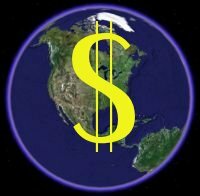 Another company, called GlobeAssistant.com, is offering services to help businesses in the travel industry, real estate, and news services to use Google Earth to enhance their businesses. For example, they are selling a service to take recent news stories and present the location of the story through an RSS feed in Google Earth format. I recently wrote about a software product someone is developing specifically for use with Google Earth called EarthPlot. News organizations can use Google Earth to quickly show its readers or viewers geographic references related to their stories. This has already been done numerous times. And I expect it will become more common as these organizations learn more about Google Earth. I expect Google will have special pricing and special versions of the tool for these customers as well. Travel is a very interesting area which would allow businesses (say travel agents) to provide special presentations on tours, hotel locations, restaurants, etc. for prospective travellers with Google Earth as the presentation vehicle. They could also use it as a research tool to quickly find information customers are interested in finding. Sports is another area with enormous potential. I used Google Earth to learn more about the Tour de France routes, and the location of the riders in just a few minutes than I had ever learned in the past. I watched a Paraglider race through the Swiss Alps using Google Earth. Using it to watch long-distance sailboat races is another thing I expect to see any day. Google Earth has a very open interface for allowing outside data resources to be incorporated both statically and dynamically within it. There are many applications people haven't even thought of which will result in business opportunities. I forsee applications for computer games, flight simulation, custom weather data, sports, travel, oil exploration, TV shows, and much more. The other thing about Google Earth is that it is free and supported by a very high-profile company like Google. The type of market awareness they will generate when they release Google Earth more publicly will guarantee a high number of people who use the application. This will translate into market opportunities for many kinds of businesses. Based on our experience with this phenomena starting with Mosaic and Netscape, I'm confident great things are in store for Google Earth and innovators who ride the wave. A guy named Michael Heizer has been working on a sculpture for 30 years. He's building what looks like Aztec buildings in the middle of nowhere in the Nevada desert. I found this story while browsing the web and looked up the location in Google Earth (I wish I could remember where I found it exactly). You can read about this amazing creation in this article by the New York Times. It has ground based pictures. Unfortunately, the resoultion is poor in this area of the Google Primary Database, but the fact you can see a sculpture from a 1km resolution photo at all is a tribute to the size of this work. You can visit this site in Google Earth here . Or you can see a better resolution shot from a aerial photo at Microsoft's terraserver.microsoft.com. Earlier this month an excellent application of Google Earth for real estate was released at coloradofuture.com (use their interface to search for houses, then select the Google Earth listings). These guys have taken their house listings and put them into Google Earth so you can look around their region of Colorado and find houses within your price range, look at the property within GE, or look for detailed information on the listing at their web site. Google Earth is obviously a powerful potential tool for learning more about an area surrounding some real estate you are interested in. You can check for nearby things like grocery stores, malls, railroad tracks, and ATMs. You can look for hazards such as trash dumps, flood plains, and unwanted commercial buildings or traffic. 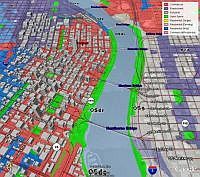 And, as more cities include access to their GIS data (like the City of Portland), you will have even more powerful data to access within GE. Significantly, the Google Earth team claims they have already had numerous people contact them that they had purchased buildings based on the input they gathered from Google Earth. This real estate application was announced in this post at the GE Community BBS. Already, another real estate listing was mentioned in the thread as available in Florida. Some excellent work by leanbackvids.com give you a chance to see Google Earth in video without having to install the application. Could be useful if you want to show someone who isn't likely to install the application itself. But, they are worth a view regardless. Any Google Earth user can't help but smile at these. The second video is called "Mirror World" (Quicktime required) and is a video of a tour of Seattle using Google Earth to do the tour and real video used to show more details. 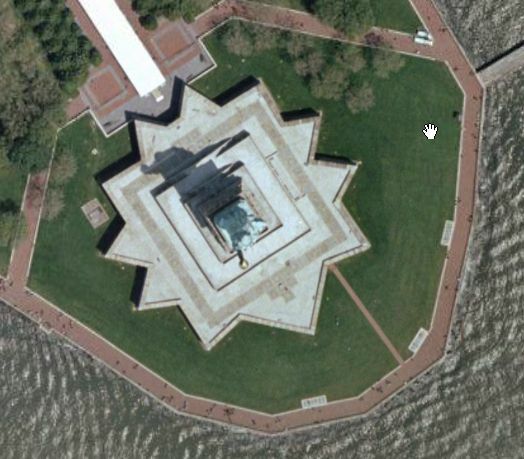 They have cleverly matched exact angle/views within Google Earth to dissolve into the real video. Very nice! These videos were brought to my attention by Matt Savarino at vlogmap.org. Speaking of Ogle, I just found out that there's a new beta version of Google Earth available when you download Google Earth called version 3.0.0529. One new feature allows you to share a Placemark with the Google Earth Community, and I assume ultimately with the BBS Layer. I'm not sure this is a good idea, because the layer is already getting cluttered (see this story). Not only that, but this new version of GE uses Internet Explorer to execute the post (even if another browser is your default) - Bad Google! [Edit: 11:45AM] Google has already responded that I have found a bug with the external browser use and they'll fix it. Also, they say they are working on the duplicate placemark problem. Also, they are just getting ready to release this version to the "Check for Updates" option in GE. 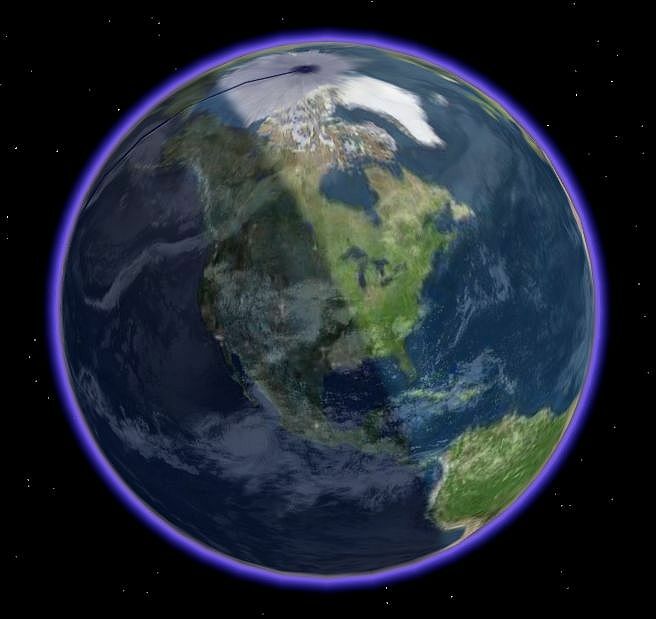 Another blog all about Google Earth is Ogle Earth. Written by Stefan Geens in Stockholm, Ogle Earth has more of a technical focus, and he is very good at picking up new things coming out for GE. Definitely worth a read if you are really into new GE trends. Hurricane Katrina has just passed through Florida and is gaining strength in the Gulf of Mexico. 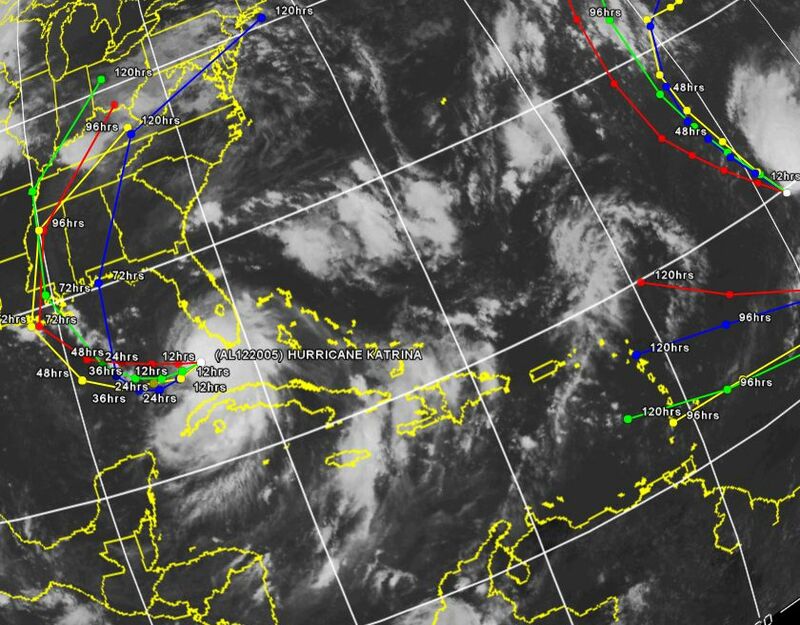 This is a good time to talk about another weather resource for following Tropical storms in the Atlantic. 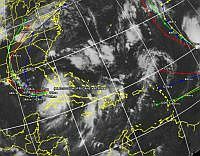 In a timely post back in late July, Paul Seabury (the same guy who posted the excellent resource showing All Hurricanes Since 1851 I wrote about earlier) has compiled a network link that automatically presents the current forecasts models, sea surface temperatures, satellite pictures, and other data for all current Atlantic tropical storms. You can download it here . This is such a convenient tool, I've made it a permanent part of my Places folder. Make sure you explore the various sub-folders which contain things like SST (Sea Surface Temperatures in various formats), and Satellite Images. Excellent work again Paul! 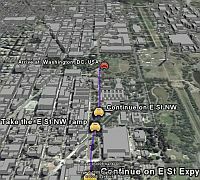 Last night ABC Primetime used Google Earth in a story about 911 services using location technology for cell phone users. They apparently zoomed in on New York and gave credit to Google Earth in the upper right corner. This is just one of many examples of news organizations using this technology both on TV programming as well as in their online news media. Google Earth is a great interactive visualization tool, and more people are realizing it every day. I just discovered that the release of Google Earth that came out earlier this month included a new feature called "Overview Map". 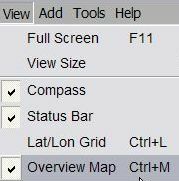 Turn it on by going to the "View" menu as shown to the right and select "Overview Map". This is actually a very nice tool which shows a minature overview of the earth map in the upper right corner of the 3D view. A red rectangle highlights your currently zoomed in view. If you point your mouse at another location on the overview map and double click your left mouse button you will be flown quickly over to this new location (and end up at the same altitude as your last position). The overview map helps you keep perspective where on the Earth you are looking at, and is a fast way to go to another part of the world you want to see. You can turn this overview map on and off by keyboard shortcut: Control-M. You can also adjust the size of the Overview Map by going to the GE Options (under "Tools->Options" on Windows, or "Preferences" on the Mac). Here you can also change the "Zoom Relation" which means how close the Overview Map matches the zoom level of your current view (default is infinity). 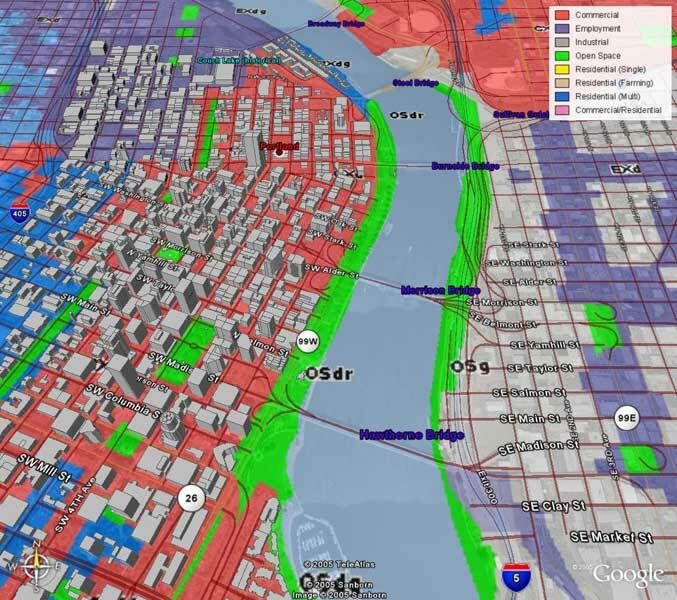 The City of Portland, Oregon's GIS (Graphical Information System) team just announced public availability of their KML (GE compatible) files allowing access to several layers of GIS data for their city. This includes things such as crime statistics, zoning, earthquake data, flood plains, and a lot of other useful data. The neat thing is that these are network layers and are based on your current view of the city. It takes a bit of time to get used to, but you zoom to the area of Portland you are interested in, and a couple of seconds later an image loads showing that layer's data. You need to turn off a layer (click on it's checkmark box in the Places box), before loading another one or things become confusing. So, you can go to their web site at: www.portlandmaps.com/google.cfm. If you're just curious, I suggest scrolling down on this page and viewing their screenshots, and clicking on the corresponding KML file for the layer that interests you. Or you can click here to see the Zoning layer shown here. This is yet another example of serious business applications using Google Earth as the visualization tool. 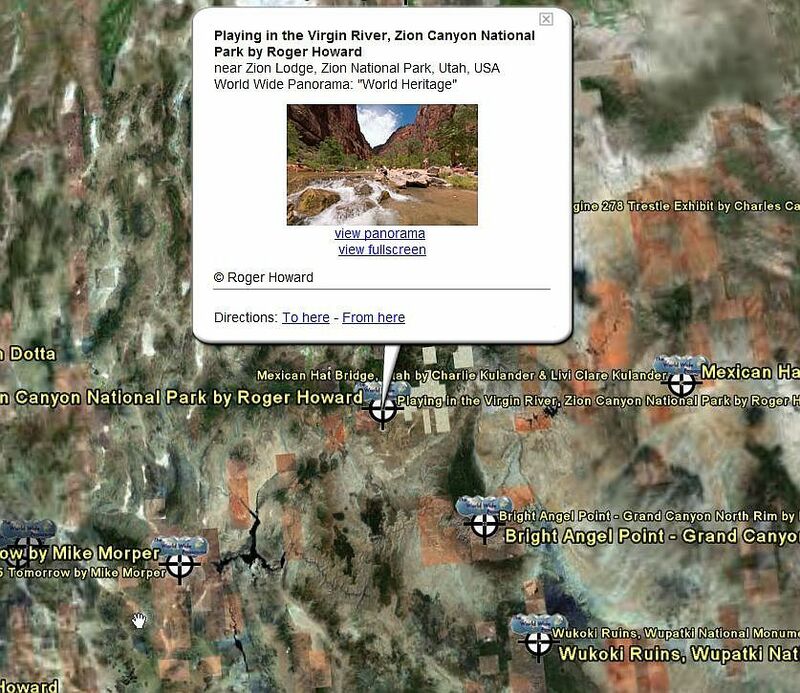 One of the nicest features in Google Earth is the "Play Tour" viewing mode. If you have a series of placemarks (for example, if you have entered in something for directions) you can fly along the path or series of placemarks. 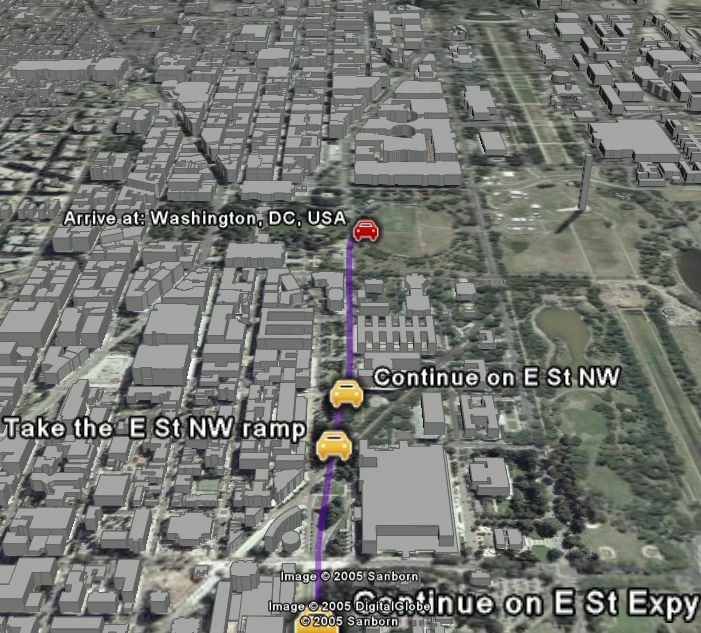 For example, at the top left click on "Directions" and enter "Arlington, VA" at the start, and "Washington, DC" at the end. Next click "Search". The route between these two will be calculated. Now, you will see small "Play Tour" and "Stop Tour" buttons appear in the lower right below the directions. "Route" should be highlighted. Click the "Play Tour" button and you will be flown along the route to Washington, DC. (For added fun, select "Buildings" to see the 3D buildings of the Washington, DC area). If you have a series of placemarks in your Places, you can select the folder with those placemarks and use the Fly Tour mode there as well. A keyboard shortcut - F10 - can be used as well. You can adjust the speed, viewing angle, and height by going to the menu item "Tools->Options" and selecting the "Control" tab. Click on "Advanced" to adjust the Camera Tilt and Range. The GE/Keyhole Community BBS has some limited means of showing you which are the most popular Google Earth places. 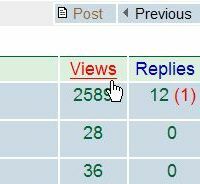 You can go to the subject forum of your choice - say "Earth Browsing" and then select the "Views" link (as shown to the right). This will sort the forum according to the most viewed threads. Reading the resulting threads will probably lead you to some interesting places, but it is not really a very good measure of the most popular downloaded GE files. I have yet to find a way to view the most downloaded GE files on the BBS. I assume Google will do this someday. To see the places themselves go here (after you have registered with GE Hacks you can load them into GE). Another even nicer feature Google Earth Hacks has done is provide a network link which automatically shows you their current top rated places. EarthPlot is a brand new software product which is intended for use with Google Earth. It was announced at the BBS there will be a demonstration version, and a full version will be available for $29.99. I looked at some of their screen shots and their sample GE File, and it looks like the product has some potential. It allows some sophisticated graphing and data visualization features and the import of data from a variety of formats. What I find significant is that the beta version of Google Earth is already resulting in several new business opportunities. I've seen a few other ventures as well, and will be writing more about these new business opportunities in a blog entry later this week. Another feature not found by some beginning users of Google Earth is the 3D buildings layer. You turn on the "Buildings" option and, for 38 of the largest cities in the US, and many cities in Japan, Google has created 3D models of the many buildings in that city. Try Chicago, Illinois for example. Make sure, after you turn it on, that you use the "Tilt" feature as I described in an earlier entry. 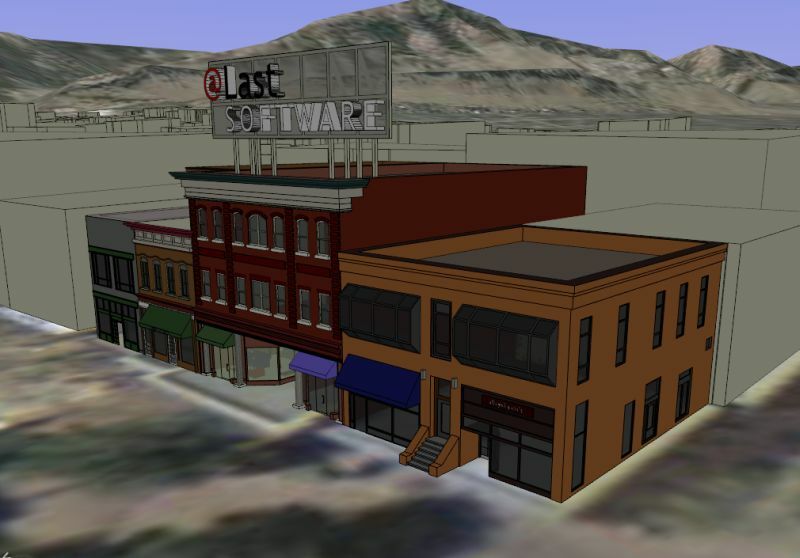 Some enterprising guys posted their own smaller town in 3D at the GE Community BBS with a very nice model of their company's (@ Last Software) building in Boulder, Colorado. Here is their post, and you can open their version of Boulder, Colorado in 3D. This is just a precursor of potential ways of advertising your business using the Google Earth. Layers are the links to Google Earth's databases of place marks including dining locations, roads, railroad tracks, etc. Right now, many of the layers of data are pretty much confined to the US (although many countries have the Roads layer and Airports layer). Over time they will add other countries to the different layer types. 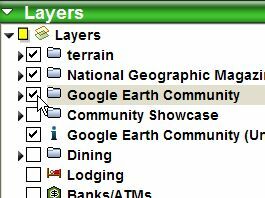 Some beginning users are slow to notice the Google Earth Community (GEC) layers. These layers simply a database of placemarks which were posted by people in the forums with a link back to the post if you open the placemark. 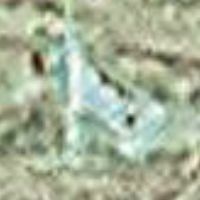 As people discover things, they post a placemark about it at the Google Earth Community. Then a month or so later, Google processes these placemarks and adds them to the GEC layers. 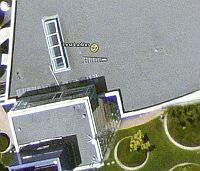 When you select the Google Earth Community layer, and start zooming in to areas, you will see these blue "i" icons appear and labels naming the place mark. They mark points of interest to people who have posted in the forums. You can click on the "i" icon and see a link to the post (usually it says "more"). This links you to the post and possibly more details about that placemark. The GEC layer can be a truly unique and interesting way to learn things about places all over the Earth. I highly recommend you try it out. You will learn things you never knew about places all over the world, or just find interesting things captured by the satellite photos and aerial photography used in Google Earth (like military jets in flight). Since Google Earth was released, the Keyhole/Google Earth Community has grown by leaps and bounds. When this layer was first created there were probably a few hundred place place marks. Right now, there are probably over several hundred thousand, and it's only going to grow. There are several threads of discussion about the growing clutter of the GEC Layer (see this one for example). Many people are making posts in the database pointing out the same thing (I think there are 10 posts about the US National Monument already). Some ambitious people are creating place marks of every building in their town or city. Several cities already appear very cluttered when you turn on this layer. The Google Earth database people have posted that they are working on the issue. It's safe assume that the masters of a huge database like Google will come up with some good solutions to the growing problem. Perhaps they will break down the layer according to topic types in the forums [yes, they did this], or maybe they will use the ranking system. I hope they do something before they update the next database. In the last 30 days there were about 40,000 new posts on the web site. But, even with the clutter, I highly recommend you use the GEC layer and learn more about the world and use it to find interesting or exciting new places. It turns out I was one of several who posted about the ladder in the forums. Some people added amusing thoughts like: "How do you find a lost ladder at Google? Do a search in Google Earth!" or "Evidence of a Google Crime Scene". Add your own picture title in the comments here for more fun. 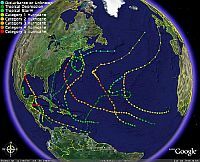 In a post a month ago, Paul Seabury announced he had converted the tracks and information on all Hurricane Tracks since 1851 into GE Files. Here is a link to the web page where you can download the files for each decade's worth of tracks. Each file contains place marks organized into folders for for each year, and so on. As an example, he offered the 1960s tracks . Open the GE File and you will see a new Places entry,and 1960 hurricanes storm tracks will appear (as shown above). A legend showing the storm category colors is also shown. Open the places folders to show a particular year and turn it on. You will see all the storms for that particular year. 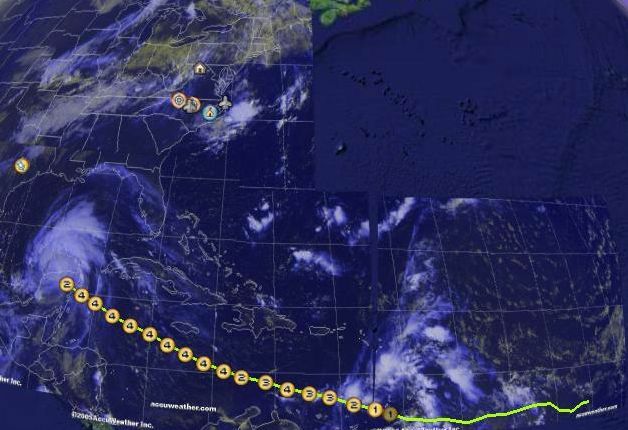 If you zoom in, each mark on the track is labeled with the date and time of position, clicking on a mark on the track shows even more storm information. In a post last month Thomas Rauscher announced his places file which allows you to view the locations and access the neat panorama photos from around the world courtesy of The World Wide Panorama. Most of the panoramas use the Quicktime VR plugin, so you have to have Quicktime with the VR viewer installed from Apple. I like the way Thomas has added photos of the panorama in each placemark and links to the panorama photos themselves. The links take you to the World Wide Panorama web page for the specific panorama. Just found another photo finding network link which, based on your view, will show the nearest photos in the Geosnapper.com database. This link was posted by technomagination at the GE Community site here. This network link works just like the Geotagged Flickr network link I wrote about earlier. 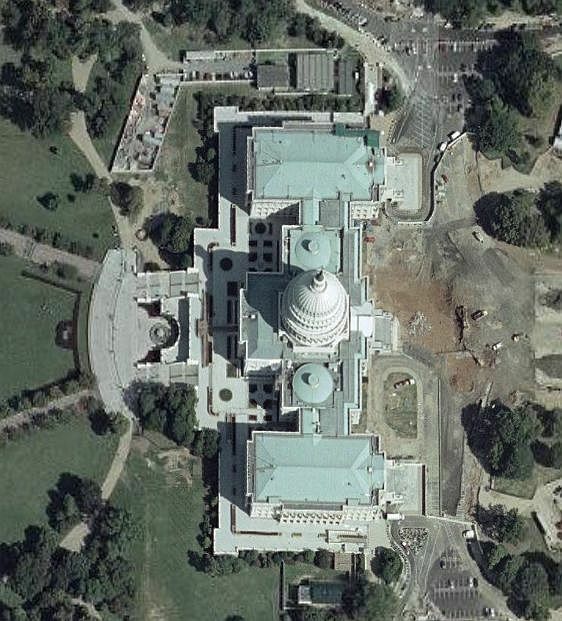 The recent update to the Google Earth database puts back the US Capitol Building and the White House which were blurred out in the earlier database. This is apparently in response to the complaints from some worried about how Google Earth photos could be abused by terrorists (despite the fact that all of these photos are readily available from many other sources). I guess Google Earth has taken the position they shouldn't censor anything if the data is readily available. 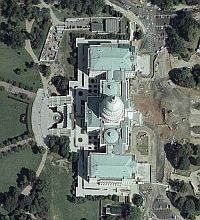 Google Earth has just updated their database with new imagery enhancing the resolution for over 100 cities around the world. You can read their announcement at the Google Earth Forums. Like other updates Google has made in the past, there are probably other places updated not in their list. Yet another reason to go exploring Google Earth! Once you've found a geocache, and clicked on the "View @ Geocaching.com", the Geocaching web site shows all kinds of details for each Geocache including its coordinates, a description of the cache, and maybe even hints on how to find the cache once you get there. It also contains the log entries of other people who have found (or not found) the cache. The log entries may include photos of that spot and details of interesting things nearby. This is an interesting way to see what other people think about a location. If you are going on a vacation, and own a GPS, you owe it to yourself to use this network link. Plan to visit a few interesting geocaches, or at least use this to find even more interesting places (that you probably won't find in a guidebook). If you are a geocacher, you will find this a much easier tool for finding interesting geocaches than anything I've seen to date. This is just the beginning, but the guys at GoogleEarthHacks have created a game using Google Earth. This is a war game which they claim is largely text-based. The object is to grow armies which you place at various cities and try to hold the cities. There is a GE KML file which lets anyone view the "action" (more like a status) of the game. This is the first of many games I'm sure will be created using GE as a visualization tool. I expect to see more direct, or interactive, use of GE to play a game soon. One of my first serious uses of GE was to examine data from a recent backpacking trip. 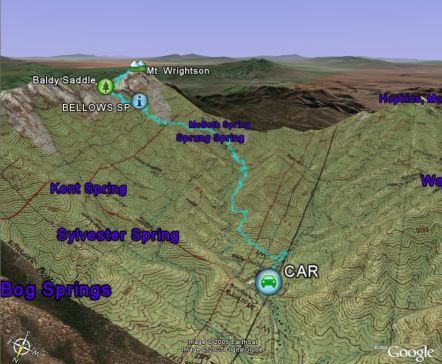 The backpacking trip was up Mount Wrightson, Arizona and I took my GPS along for the hike. I saved the track and waypoints from the GPS and imported them into GE. Then I superimposed a USGS topgraphical map of the area for further reference. I also added some photos taken during the trip (which I georeferenced using the GPS track and time stamps from the camera). The result is a GE KMZ file which you can view which really illustrates the backpacking trip. Especially if you use the tilt function (I recommend using your middle mouse button if you have one) to see the rugged terrain of this 4000 foot ascent. You also get an idea just how fabulous the view is from this peak. By the way, if you turn on "Borders" in GE you can see that the border of Arizona and Mexico is easily viewed from the peak. 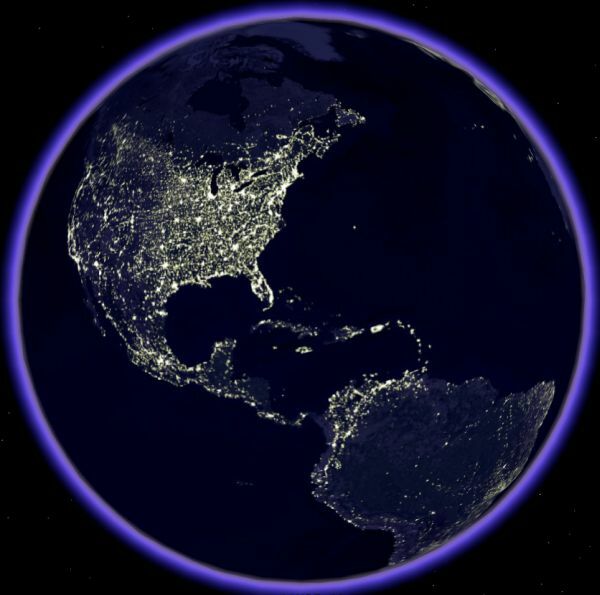 Here's a nice little addition to your My Places which shows what the earth looks like from space at night. Astronomers see this picture as light pollution ruining our views of the heavens. Environmentalists see this as wasted energy. I have to agree with both. It wouldn't take very much for us to start creating better lighting systems that light the ground, not the sky. But, still, this picture is pretty! One thing missing when you see the earth upon opening GE is the lack of any clouds. This link will open a KML file which downloads the latest view from space of clouds for the entire earth. The satellite photo is usually only minutes old, so the coulds are pretty close to real-time. The image file is about 450K, but those of you who use Google Earth probably have the bandwidth. I keep this "Global Cloud Map" in My Places for a quick look at what kind of weather is out there. As a pilot I have used GPS for navigation in my plane since 1998 (starting with a Garmin GPS195). 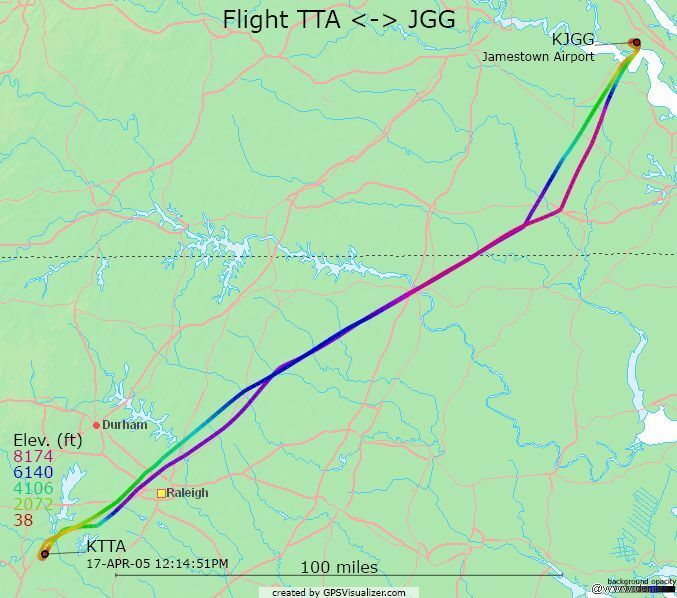 During the last year, I discovered you can use tools to document your flight by saving your GPS flight log to your computer. One tool I found particularly nice is called GPS Visualizer (at www.gpsvisualizer.com). The picture at the right (click the picture to see larger) is an example of a flight I made shown in GPSVisualizer. The color of the track represents altitude. I've shared GPSVisualizer's capabilities with other pilots (oh, it's also good for all kinds of other GPS activities by the way), but after seeing Google Earth I immediately wanted to try my flight tracks in it as well. Unfortunately, Google Earth does not import altitude information correctly for non-terrestrial GPS tracks. So, your tracks end up on the ground (i.e. you can't see the altitude when tilting your view in GE). There is a way around this if you want to follow some rather tricky steps (read this thread and this particular post for the best method so far). As a pilot you can use Google Earth to plan your flight, and make sure you fly over, or to, interesting places. You can also check out the airports you are going to, and even bring in weather overlays to do some weather flight planning. Isn't Google Earth amazing? Cuando muestro Google Earth a gente conocida por primera vez, hago un clásico acercamiento hacia la casa de alguno de ellos. O activo capas como la de Bancos para mostrar datos útiles. Pero la gran impresión que dá Google Earth es cuando se utiliza la función "Inclinar" y se vé que el mundo está en 3D! Cualquier área montañosa sirve pero veamos el Monte Santa Elena que es una muy buena vista en particular. 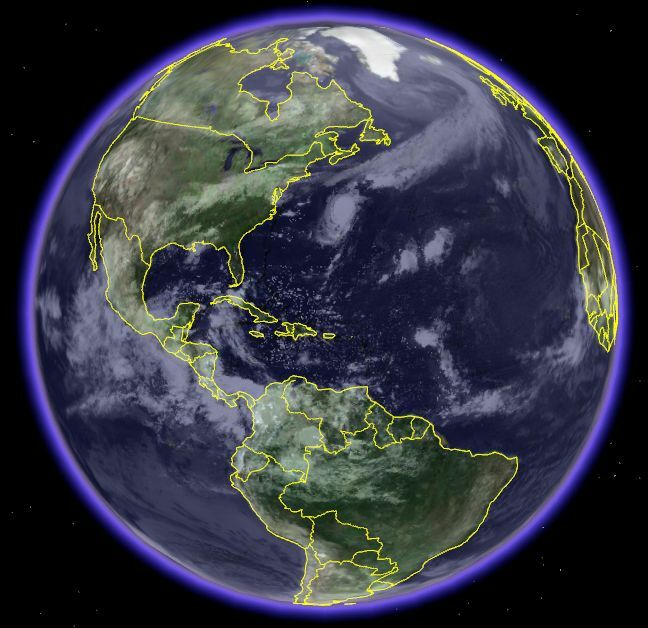 Luego de ir allí, encuentren el control deslizable a la derecha del área de navegación de Google Earth (cuando pongan el mouse sobre él, aparecerán los controles, arriba a la derecha), y pruébenlo. Consejo Importante: El mejor modo de tener control de GE es con el botón del medio del mouse. Ténganlo apretado y verán cómo pueden inclinar y rotar al mismo tiempo la vista. 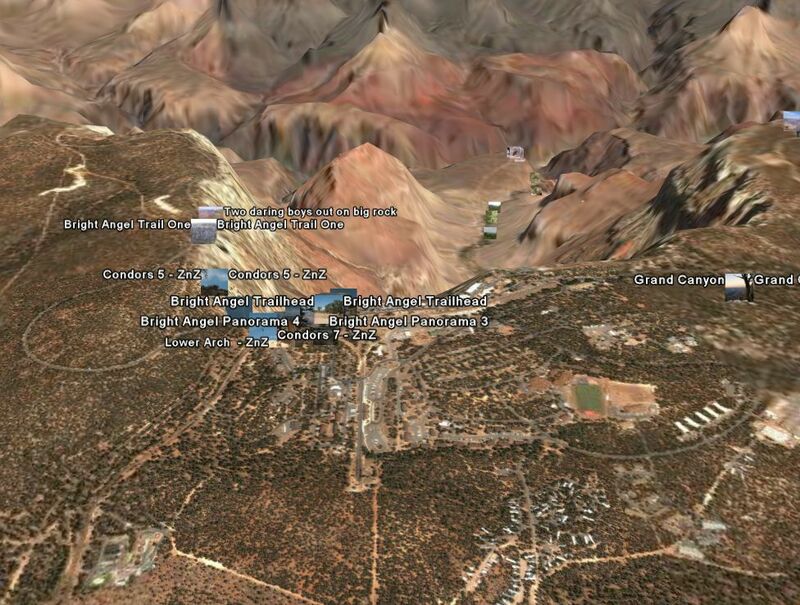 This is truly an amazing feature of Google Earth. It's all about the network link - a feature Google Earth has to allow a place you are viewing to tap into applications or data running on someone elses server on the Internet. You can click on the little photo icons and a pop-up cloud appears with a link "View at Flickr" which will let you see the full-sized photo. 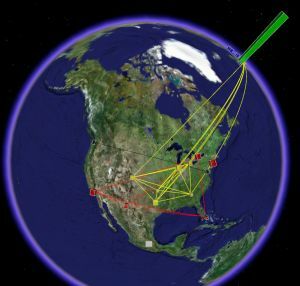 The Network Link is the most power feature within Google Earth. There are already lots of interesting features being implemented using the network link and I predict there will be even cooler features coming out soon. I found the Flickr 50 network link through this post at the Google Earth Community. All of us go and explore the Earth after installing Google Earth (GE). But, some of the most interesting things are hard to find. Thankfully, thousands of other people want to share their finds with you. The hard part is finding the best. The first place to look is at the Google Earth Community (it's at the Keyhole site, since Keyhole was the original version of the product before Google bought Keyhole). You can find all kinds of interesting places by reading these forums. But, the format is kind of hard to use to delve through all the information and find the real gems. Another good site is www.gearthhacks.com. At the time of this writing they have over 2000 entries and a nice "photo" gallery approach to showing interesting Google Earth places. I will be including these and other locations in my reference section soon. During mid-July Hurricane Emily crossed the Caribbean and the Gulf of Mexico. I was just learning about Google Earth's KML file format, so I decided to create a hurricane track . Based on another post in the GE forums by someone called mcshea98, I created a track and updated a few times a day based on data from WeatherUnderground. The numbers along the track represent the hurricane category, and if you click on the numbers you will get data such as wind speed and pressure. I posted the KML file on the GE Forums here. Both visual satellite and infared satellite photos are downloaded in real-time when you first open the GE file. Since the storm is long gone, what you will see now is the current weather conditions. As you can see from the screen shot, the hurricane was located where my track was at the time of the screenshot. Click here to see the file itself from within GE.